If you're bored or you simply have too much money to waste, this might be the final result. 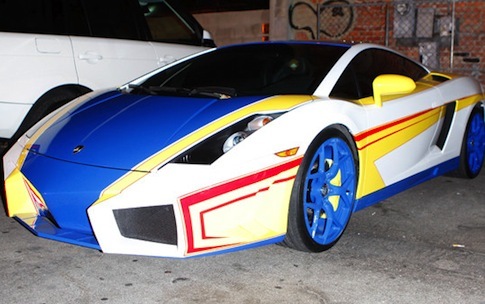 Chris Brown (known as a gentleman towards his girlfriend Rihanna) now is known also for his terrible lack of taste. 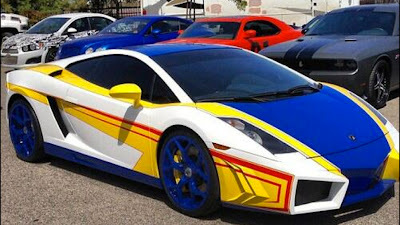 Don't know how he came into his mind with this idea, we only know that he sent the car to West Coast Custom and what you see below is how his Lamborghini Gallardo looks like. The front bumper looks like an awful replica-style of a Reventon, and the paintjob is just revolting, it reminds me a mix of a japanese manga robot mixed with a toy car that I would have never wanted to receive in my childhood. One does not simply own and leave stock his supercar?